How to make 'Triangles' from Panorama. This sweet is absolutely delicious! It gets its name from the shape, obviously, and also from the fact that it is a speciality of a district just outside Thessaloniki called Panorama. Making them is rather time-consuming, but absolutely worth it. Whoever you serve with these will love you for it! The recipe below is for 24 triangles. Take 1 sheet of filo pastry and keep the others covered in cling film so as not to dry. 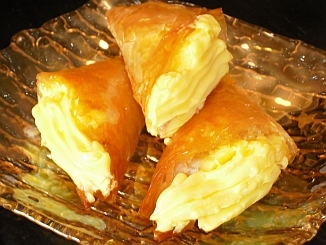 Brush the filo with melted butter. With the filo lengthwise, fold it twice to reach halfway. Cut the filo at the halfway point and do the same with the other half. Butter the two lengths of pastry you now have. Start from the corner of one end to fold small triangle shapes (see photos below) until you reach the other end. Cut off any extra pastry. Do the same for the other length of pastry. Repeat this process for each of the filo sheets, remembering to cover the sheets not being used, with cling film so as not to dry. Put the triangles in a shallow, buttered oven tray. You may need two trays. Brush on top with melted butter. Put in a preheated oven at 190 degrees Celsius for approx. 20 minutes or until golden brown. While they are in the oven, prepare the syrup. Put all the syrup ingredients in a pan and boil for 4 minutes. Pour the syrup over the triangles and set them aside, uncovered. Put the milk, sugar and vanilla in a pan, mix well over a low heat and leave on the heat while you prepare the 2nd mix. Put the 2 whole eggs and extra 3 egg yolks in a bowl and whisk well by hand. Add the sugar whilst continuing to whisk. Gradually add the corn flour whilst continuing to whisk. It is very important that the mixture is smooth with no lumps. Just before the milk in the pan is about to boil, take a ladleful of the milk mixture and add it to the egg mixture and whisk. This is to raise the temperature of the egg mixture gradually before it is added to the milk mixture. Now add the egg mixture to the pan with the milk mixture and whisk well for at least 5 minutes, while still on a low heat. The mixture will have thickened now and it should be smooth with no lumps. Remove from the heat, add the butter and whisk well until the butter has been absorbed. The mixture needs to cool gradually – not quickly – so we spread it in a shallow oven pan to cool. As it is cooling, turn it and spread it gently every so often, so as not to form a crust. Once it is completely cold, whip the 300g whipping cream in a mixer. Add the cold cream to the whipped cream in the mixer and continue mixing for approx. 1 minute until it is one smooth cream. Put the cream in a pastry bag with nozzle and fill all the triangles. I adore trigona! Thanks for the recipe-I'd love to try to make them here in chilly England. You're very welcome @feed belleza and @T! Enjoy! I've had these at Panorama and they are amazing! You can eat them with a side of vanilla ice cream if you want.Thank you for the recipe!